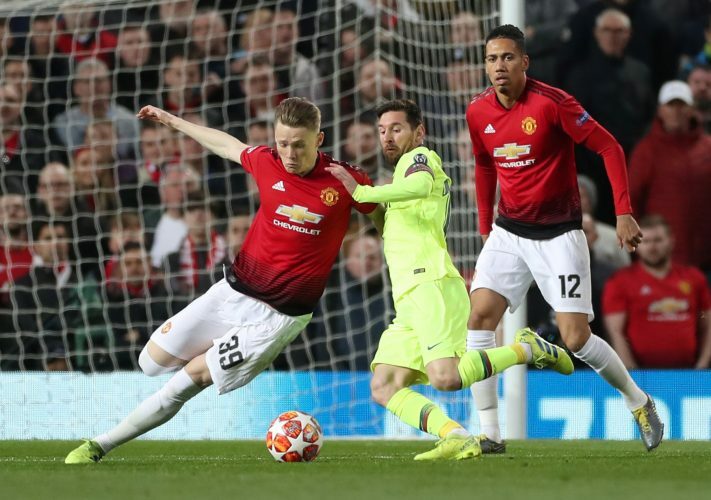 Manchester United’s tryst with Barcelona continued at Old Trafford on Wednesday in the Champions League, as the Spanish side emerged victorious with a 1-0 scoreline courtesy of a Luke Shaw own goal. The game wasn’t the Barca walkover that most pundits had predicted. Quite to the contrary, the erstwhile confident and well-passing side was brilliant only for few stretches against United, and the second leg seems to hold some interesting sights just yet. Ole Gunnar Solskjaer will have emerged from this game with numerous positives. It would be foolish for anyone to write Manchester United off at this point. Their past antics against Juventus and PSG alone show that it is in the away games that the side’s brilliance truly emerges. It is fascinating to see how differently the Norwegian gaffer shapes up his team for away encounters, and his range of success there is evident. United were very successful in containing Barcelona on Wednesday, and the fact that the traveling side wasn’t at its best will be encouraging for the Red Devils. However, the Camp Nou and the presence of an electric Spanish crowd may just tip the balance. Bereft of Nemanja Matic and Ander Herrera’s experience in the midfield due to injuries, more than one pair of eyebrows were raised when Solskjaer elected to use Fred and Scott McTominay in the middle instead, that too against a team of Barca’s quality. However, the young duo played incredibly well, and proved that Solskjaer’s faith was well-placed. They mastered the midfield in brilliant fashion, and were often at the heart of the issues Barca were facing in trying to convert their game from the back into the frontline. The duo is getting better and better with each game, and such a performance lacked only the luster of the PSG game. With Pogba upfront to fulfill creative attacking duties, the two can certainly look to occupy these spots for quite some time to come. The biggest clash that pundits were repeatedly harping on about in the buildup to the game was Smalling vs Messi. The defender himself acknowledged the enormity of the task during the pre-game press conference, and expressed delight at getting to defend against the likes of Mbappe, Ronaldo, and Messi this season. Sure enough, the Englishman was brilliant at the back and contained Messi successfully. In fact, he got closer to Messi than most defenders do elsewhere. Messi’s bloody nose, and the fact that the Argentine striker managed zero shots on target from open play may set the stage quite well for a possible Camp Nou revenge. Even against Suarez, Smalling held his own quite well, and it is games like these that put one’s opinion of the defender into some confusing jeopardy. While the Catalan giants did struggle immensely at Old Trafford, unable to function with their usual swagger and suave, there is no denying that their goal was a traditional one. The sheer beauty of the build-up makes it seem hard to believe that the same team found it difficult to string smooth passes later on in the game. Every single one of their outfield players was involved in the creation of that goal, and 48 passes were exchanged in the buildup. It’s almost a pity that the charming goal was initially disallowed as a Suarez offside. However, the importance of VAR was highlighted, and the goal stood, as a Luke Shaw error into his own net. Not the way Barca would have liked to see their efforts culminate in, but there’s no denying that they’ll happily take home the all-important away goal. Gerard Pique’s past at Manchester United is often forgotten. Solskjaer may have put it best in his press conference when he attributed the Spaniard’s lack of success at Old Trafford to the unassailable defensive duo of Vidic and Ferdinand operating at the time. In his return to Old Trafford, Pique was spot on. He was rock-solid at the back, and contained United from taking even a single shot on target. He succeeded in stopping both the physical Lukaku and the pacey Rashford, and given how Lenglet was far from confident next to him, it is fair to say that his contribution may be the crucial difference between the two sides at the full-time whistle.